Personalized pet portraits by Toperfect company, our animal portraiture artists work on custom orders of UK horse portraits for sale, bird portrait painting acrylic, cat portraits watercolor and oil paintings by skilled painters. Toperfect, the terminal to your hard journey of searching for pet photo portraits! Toperfect Art supplies animal portrait paintings by pet oil portrait company and artist, our painters provide personalized service of cat portrait, horse and bird, all are painted by professional studios of pet portraits paintings. Our pet portrait painters not only supplies animal portraiture but also sell famous oil paintings on canvas of pet family portraits and other beautiful animal art such as horse, cat, bird, rabbit, dog. The art from pet portrait photography includes watercolor, oil painting, pastel pet portraits, and acrylic. Toperfect Art provides pet portrait oil painting photo. Animal, no matter are wild and fierce animals, like lion, leopard or tender and docile animals like, horse, bird, cat and dog have coexisted with human beings. Therefore, they have never quitted the circle of human beings. They even enter culture of human beings and become the theme of animal portrait art. People like pet portraits painting. Therefore, the pet portrait artists of Toperfect studio provides custom pet portraits. No matter what kind of pet you like, you can find right portraits of pets for you. 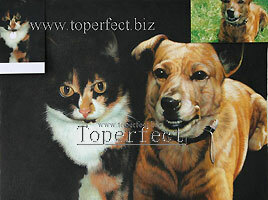 Toperfect supplies pet oil portraits that can add additional happy and light-hearted atmosphere to your life. 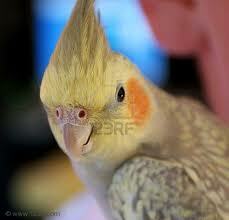 Pets that often as theme of animal portrait painting are indispensable for human beings. Many of us enjoy the companionship of pets. We also supply animal oil paintings wholesale, reproductions of famous pet paintings for sale, pet portraits acrylic, and animal portrait in oil. 1, Please send your photos by email to the pet portrait studio of Toperfect Art, and provide instructions as detailed as possible including the size and type of pet portrait painting such as acrylic, pastel, oil paintings or drawing, as well as your name, Tel No. and detailed physical address. 2, We'll make an invoice for your pet portraits photography. You send down payment. 3, Once receive down payment, Toperfect Art will choose the most suitable pet portrait artist to work for you. 4, We'll take pictures of the finished pet portraits paintings and send it to you by email. We'll adjust the work till you're satisfied. 5, Then we arrange shipment by express. Here is our wholesale price excluding shipping cost in general for 1 animal, will increase for more pets. 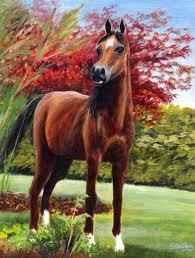 The price is same for horse portrait paintings, cat portrait, bird and more. It will be helpful if you tell us your budget, we tailor the most suitable style in your budget for pet portraits painting from photos. In fact, according to a 2002 survey by the American Pet Products Manufacturers Association, 62 percent of American households include pets such as cat, horse, bird, rabbit and more. The role of animal portrait don't ask for much - just a short list of basics such as food, shelter, veterinary care, and, of course, our care. Custom pet portrait paintings supplies far more in return, teaching us about love, improving our emotional and physical health, and providing us with unconditional affection and friendship. Companion animals are natural teachers. Pet portraits from photos are good for our emotional and physical health. Caring for a companion animal can provide a sense of purpose and fulfillment and lessen feelings of loneliness and isolation in all age groups. It's well known that relaxed, happy people do not become ill as often as those who suffer from stress and depression. Toperfect Art is famous because of our pet portrait painters who are specializing cat portrait painting, horse portrait, bird portrait, rabbit and dog portrait painting. Having personalized pet portraits of funny and lovely animals from photography can serve as the same role as pets. They can also make you relaxed and happy. Furthermore, the animal portrait UK of Toperfect depict various popular pets in various poses. Their funny and lovely gestures and postures will certainly give you a smile every day. 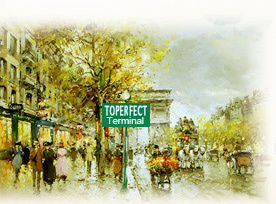 Toperfect animal portrait artists believe that you will certainly get elegant pet oil painting portrait, watercolors, and pastel art at Toperfect.